The Republic of the Philippines (or simply “the Philippines”) is an island country located in the South-eastern part of Asia in the western part of the Pacific Ocean. The Philippines consists of about 7641 islands, but they are all categorized under three main geographical divisions (from south to north), which are Mindanao, Visayas and Luzon. The capital city of the Philippines is a city called Manila, but the most populous city is Quezon City where there are so many people living nowadays. Bounded on the west by the South China Sea, as well as the Celebes Sea on the southwest and the Philippine Sea on the east, the Philippines shares maritime borders with other countries, such as by its western part with Vietnam, northern part with Taiwan, eastern part with Palau and southern borders with Indonesia and Malaysia. There is so-called “Ring of Fire”, also known as “circum-Pacific belt”, which is a major area in the Pacific Ocean many earthquakes take place as well as volcanos are, and the Philippines is located just within this “Ring” which reminds of a 40000-kilometer horseshoe, and it is associated with a nearly continuous series of volcanic arcs, oceanic trenches and “volcanic belts” and/or plate movements. There are all together about 452 volcanos in this so-called “Ring of Fire”, which is over 75% of all of the active and dormant volcanos in the world. Due to the fact that the Philippines is also close to the equator, this country tends to face both earthquakes and typhoons, but also endows it with abundant natural resources and also some of the world's greatest biodiversity. An area of 300,000 square kilometers of the Philippines, as well as its population of approximately 100 million people, makes this country far from the smallest in the world and it is known as the eighth-most populated country in Asia. The Philippines is also the 12th most populated country in the world. But, for example, in 2013 there were approximately 10 million additional Filipinos who lived overseas, comprising one of the world's largest diasporas. There are many different ethnicities and cultures which are found throughout the islands of the Philippines. A long time ago Negritos were one of the archipelago's first inhabitants, later followed by Austronesian people. Even later the exchanges with Malay, Chinese, Islamic and Indian nations occurred. In 1521 the beginning of Hispanic colonization started when Ferdinand Magellan arrived in the Eastern Samar. In 1543, one Spanish explorer named Ruy Lopez de Villalobos named this archipelago in Spanish as “Las Islas Filipinas”, which is in English “islands of Philippines”. There was a Philippine Revolution in the beginning of the 20th century, followed by the bloody war of Philippines with Americans. The name for the country of the Philippines was chosen in honor of King Philip II of Spain in 1542, as it was mentioned above. Later it was named “the islands of Filipinas”, but eventually the name “Las Islas Filipinas” was more commonly used for covering all the islands of the archipelago. Although there were other names for this country, such as “Islas del Poniente” (which can be translated as “Islands of the West”) as well as Magellan's name for the islands “San Lázaro” was also used by the Spanish people for them to be able to refer to the islands. It is known that 28,1% of Filipinos are Tagalog, 13,1% Cebuano, 9% Ilocano, 7,6% Visayans/Bisaya (but not Cebuano, Hiligaynon and Waray), 7,5% Hiligaynon, 6% Bikol, 3,4% Waray, and 25,3% as "others",which can be a mixture of the Ibanag, the Moro, the Pangasinense, the Kapampangan, the Ivatan, the Lumad, the Igorot, the Bajau, the Mangyan as well as the tribes of Palawan. Most of the Filipinos generally belong to the several Asian ethnic groups, which are a part of the Malayo-Polynesian and Austronesian speaking people. There are many cities in the Philippines, such as Baler, Angeles, Aparri, Baguio, Balimbing, Bangued, Batangas, Bislig, Boac, Bolinao, Bongabong, Bontoc, Borongan, Butuan, Cabanatuan, Calbayog, Jose Abad Santos, Casiguran, Cavite, Cebu, Claberia, Cortes, Dagupan, Danao, Davao, Digos, Gingoog, Isabella, Jolo, La Carlota, Lagawe, Laoag, Ozamis, Larap, Legazpi, Lipa, Lucena, Maganoy, Mamburao, Manila, Masbate, Mati, Naga, Olongapo, Ormoc, Pagadian, Pilar, Planan, Puerto Princesa, Quezon City, Roxas, San Carlos, San Narciso, San Pablo, San Pascual, Sorsogon, Tabuk, Tarlac, Virac and Toledo. 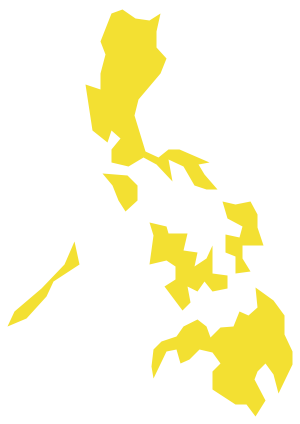 All of them can be described in a way of an illustration using ConceptDraw DIAGRAM You can create maps of the Philippines showing its population, political view and other criteria in ConceptDraw DIAGRAM within only a couple of hours, or even minutes once you have the “Continent Maps” solution, which can be downloaded from this site of from ConceptDraw STORE application. 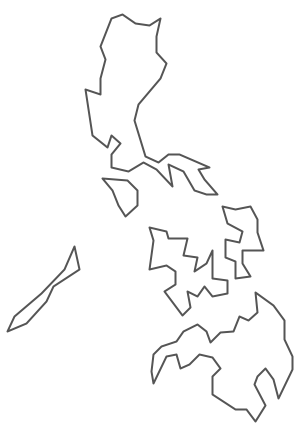 The Philippines stencil library as a part of this solution can be used for drawing your thematic maps, as well as geospatial infographics and vector illustrations. Visualize your business and thematic information connected with geographic areas, locations or customs using this solution while working in the ConceptDraw DIAGRAM application for creating your business documents, presentations and websites having a great looking as well and smart and professional result. 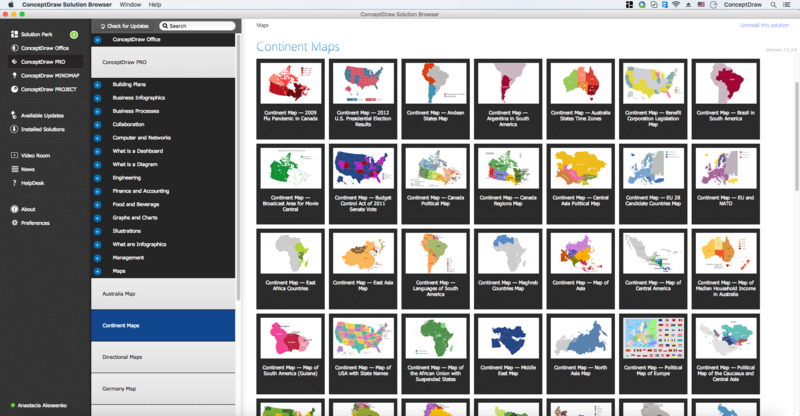 Use the Continent Maps solution and Philippines library to draw thematic maps, geospatial infographics and vector illustrations. This solution to help visualize the business and thematic information connected with geographic areas, locations or customs; for your business documents, presentations and websites. The vector stencils library Philippines contains contours for ConceptDraw DIAGRAM diagramming and vector drawing software. This library is contained in the Continent Maps solution from Maps area of ConceptDraw Solution Park. The Philippines are located in southeastern Asia. The Philippine Islands are bordered by the Philippine Sea, South China Sea, Celebes Sea, and Sulu Sea. Angeles, Aparri, Baguio, Baler, Balimbing, Bangued, Batangas, Bislig, Boac, Bolinao, Bongabong, Bontoc, Borongan, Butuan, Cabanatuan, Calbayog, Casiguran, Cavite, Cebu, Claberia, Cortes, Dagupan, Danao, Davao, Digos, Gingoog, Isabella, Jolo, Jose Abad Santos, La Carlota, Lagawe, Laoag, Larap, Legazpi, Lipa, Lucena, Maganoy, Mamburao, Manila, Masbate, Mati, Naga, Olongapo, Ormoc, Ozamis, Pagadian, Pilar, Planan, Puerto Princesa, Quezon City, Roxas, San Carlos, San Narciso, San Pablo, San Pascual, Sorsogon, Tabuk, Tarlac, Toledo and Virac. 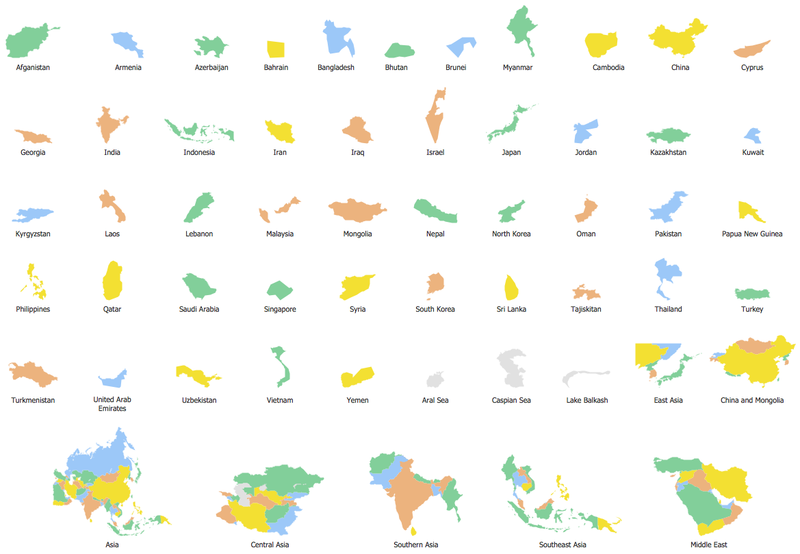 If you are interested in Philippines and the geography of Asia our large geo map of Asia might be just what you need. It is a large geo map of Asia that also shows many of the continents physical features in color. Country boundaries, coastlines and surrounding islands are all shown on the map. 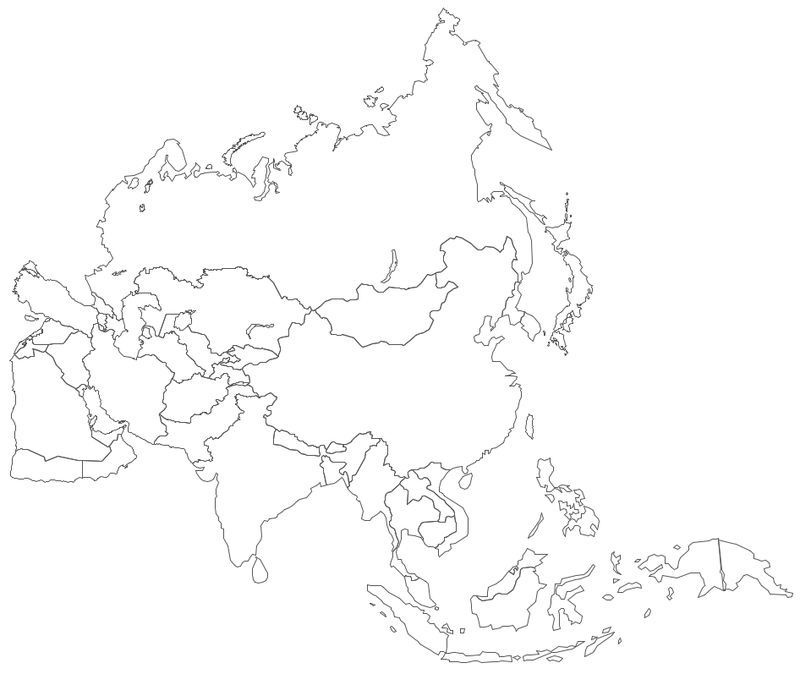 Asia is located primarily in the eastern and northern hemispheres. 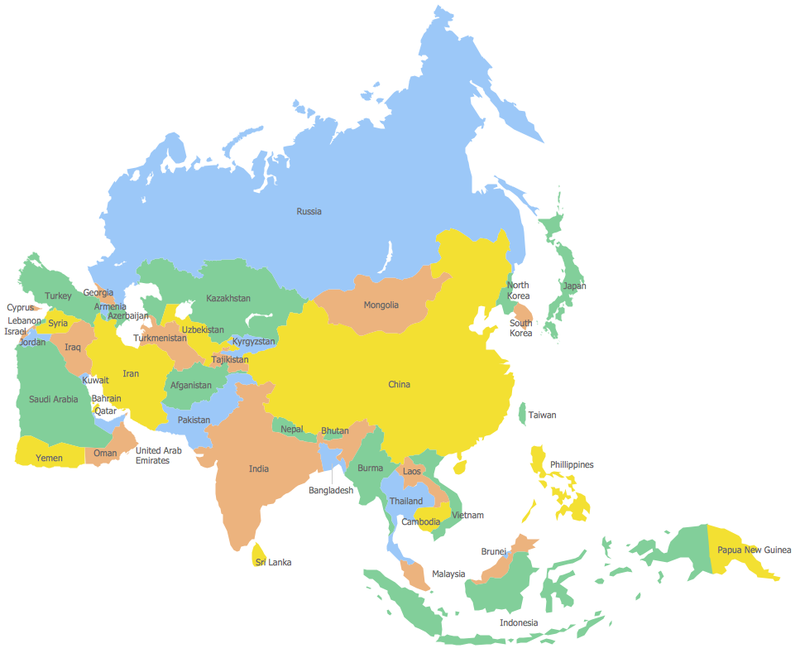 The Asian continent covers 8.6 percent of the Earth's total surface area, or 30 percent of the Earth's total land area. With approximately four billion people, Asia hosts 60 percent of the world's population. There are 48 Asian states. 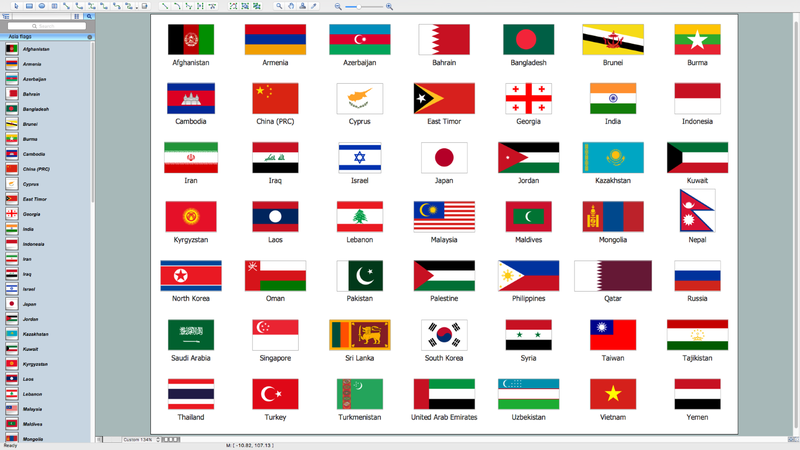 The library "Asia Flags" contains 49 flags of Asia countries. Kazakhstan, officially the Republic of Kazakhstan, is a contiguous transcontinental country in Central Asia, with its smaller part west of the Ural River in Eastern Europe. The vector stencils library Kazakhstan contains contours for ConceptDraw DIAGRAM v12 diagramming and vector drawing software. This library is contained in the Continent Maps solution from Maps area of ConceptDraw Solution Park. Designing of Continents Map is a quite complex and labour-intensive process. But now we have a way to make it easier - ConceptDraw DIAGRAM v12 diagramming and vector drawing software extended with useful drawing tools of Continent Maps Solution from the Maps Area. Japan is an island nation in East Asia. Located in the Pacific Ocean, it lies to the east of the Sea of Japan, China, North Korea, South Korea and Russia, stretching from the Sea of Okhotsk in the north to the East China Sea and Taiwan in the south. The vector stencils library Japan contains contours for ConceptDraw DIAGRAM v12 diagramming and vector drawing software. This library is contained in the Continent Maps solution from Maps area of ConceptDraw Solution Park.